One, we can start setting up the backers forums soon. Backers will receive an e-mail at the same address they’re using for Indiegogo later on the month explaining the signup process for the forums. Two, we can also contract the third party company (Backerkit), which will be helping us with the delivery of digital rewards once they’re up for distribution, as well as to coordinate stuff with the physical-rewards distribution company at the end of 2016/start of 2017 when those are ready to go. And three, that life-sized, golden-plated ice-reindeer sculpture we were not buying with the crowdfund money remains unbought. Hooray! In the middle to long term, it means that the team can and will focus their entire attention on making Them’s Fightin’ Herds as good and as soon as it can be. Lauren and Jay are still employed at their current jobs as we had mentioned before, but for everyone else, TFH is now a full-time commitment. Updates on the progress of the game’s development will be coming at regular intervals through our main site (and the forums), and in the social media sites for small, snack-sized tidbits and peeks at whatever we’re working on at the moment. For the interested parties: We still haven’t settled down on how we’ll be handling the voice acting for the game, and are currently not accepting unsolicited submissions, terribly sorry. Once we know how that will work, we’ll let you know how, when and where to apply through the main site. Prospective VAs MUST be able to work in and commute to the Los Angeles area, or have access to their own professional-grade equipment/studio to record in. There are currently no job openings in any other areas of development, but if anything happens there, we’ll let you all know through the main site as well. In other news, Lauren is now working on Tianhuo’s Book of Lore entry. This will be the final Book of Lore entry for a while (but we might bring the Book back out later for more worldbuilding! ), and should be coming up to the M6 site by the end of the week. We’re still looking at streams and their scheduling. Once or twice a month seems right for a starter point, and we’ll be letting you know when the next one is happening as soon as we have settled on a date. Also!, in a bit of a more personal note; Our friends at Labzero (who allowed us the use of their z-engine), are currently in the last 5 days of their own crowdfund for their latest game, an RPG named Indivisible; if you’d like to support an awesome team of indie game developers, go take a look at their crowdfund! 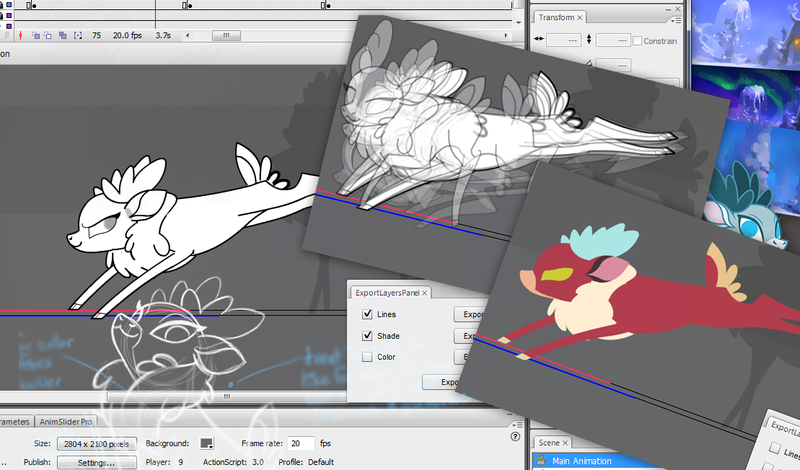 M6 out for now, and back to workin’ on making Them’s Fightin’ Herds a reality! IGG Money is now in the M6 account. Funds are moving into the M6 bank account so that necessary expenses can be made. Mane6 now working full time on the game. Tianhuo’s Lore will be coming up at the end of the week soon. Her hair is on fire. https://www.mane6.com/wp-content/uploads/2016/01/M6V3-BlackMid_Transparent.png 0 0 Mane6 DevTeam https://www.mane6.com/wp-content/uploads/2016/01/M6V3-BlackMid_Transparent.png Mane6 DevTeam2015-11-09 17:24:512017-07-17 19:37:25Crowdfund money is in! Q: So!, It’s mid May now. What have you guys been doing?, Why the long silence? A: Well, that’s actually a pretty good example on why we don’t usually give out very specific dates: Stuff has a very constant tendency to go FUBAR when we do. … And that ate up time, attention and resources from CoreDev. But we’re finally set up!, We’re now officially Mane6, Inc. (No affiliation to Monsters of any kind, except probably stream monsters), and sans a couple internal documents that need to be drafted and/or signed, that should be the bulk of our pre-crowdfund legal setup. There are still a few wrinkles here and there, but those are more annoying to the individual devs than to Mane6 as a whole. Which still leaves the rest of our pre-crowdfund setup to deal with. Crowdfunds are a delicate thing, which can fall into a catch-22 scenario quite easily. You need money to develop your project, which you can’t get without the crowdfund, which won’t succeed without a project to show in the first place, which you can’t develop without money… etc. The first thing we need, and the central piece of our crowdfund campaign is going to be showing you some in-engine footage. -Actual- gameplay, as opposed to just throwing our art assets on after effects, putting some flashy effects on top, movin’ them around, and calling it a day. Obviously, due to the early state of development, some of the art assets might be less polished than others, but in general, we want to give you guys a good first impression of the game’s mechanics. How it’ll play, and how it’ll look. We’d like to have (and have been working on) at least one functional character up to a “showable” state (which is different from a “release-ready” state), and then one or two extra characters a little bit behind on the progress pipeline to demonstrate the procedure. Place those in at least one stage and show the new UI concept, which will greatly improve readability of resources (particularly the former “Magic” Gem from Fighting is Magic), and also show some of the music work that RC has been sketching up for the new game; One of the benefits of not working in FM2K anymore is that we can go NUTS with the music system, and we’re taking full advantage of that. We’ll give you more details during the crowdfund, but we can tell you: it’s pretty exciting for us, and we’re hoping it’ll be pretty exciting for you guys as well! Here’s a bit of a preview of what we’ve been working on! And lastly (in terms of visual content), we’re working on character splash art, their definitive colour palettes, and of course, on giving them a name. We’ve already made good progress in there, but legal checks must be passed first on that front. For that eventuality, we made a large list of alternative options in case the first try doesn’t work. We’ve also been working on getting a plan for pledge rewards. We’d like to thank everyone for their suggestions when we asked on Twitter and Facebook, by the way. We’re taking your ideas in consideration. As a result, we have digital items ready to roll, and are looking at a variety of physical items, both in limited and unlimited quantities to give to people pledging to the mid to high tiers; It’s being a bit of a tough balancing act, as every physical reward created and shipped must be financed out of its pledge amount, and since the main purpose of the crowdfund is to -fund- the game, and not the rewards, we need to strike a balance between the pledge reward cost and the amount of money it will bring to our game budget. You can have a peek at our current WIP pledge reward chart (With the numbers blanked out as per the reasons above) in the following image. And… That’s about it. With the legalese bits mostly taken care of (knock on wood), we’re now fully focusing on getting the crowdfund content up and running, and once we do, it’s Indiegogo time! The Mane6 Devteam would like to give the general public a reminder that, as of February 1, 2013, we are not in any way involved, affiliated or related to the development, distribution or promotion of any material related or belonging to the MY LITTLE PONY IP. As previously informed to the public through our site, The Mane6 DevTeam has complied, and continues to do so, with the Cease and Desist letter sent to us by Hasbro’s Legal team. If it’s not located on this site, it’s not related to us. Aaaand we’re live!… I think. If you’re reading this post, you’re browsing the new Mane6 V3 site, now powered by WordPress, instead of Blogger. Ain’t this nicer? The Disqus comment system is already turned on here at M6V3, but old comments in previous posts won’t be appearing for a couple days. That’s normal. No need to panic there, and if you absolutely must panic, please panic in a quiet and ordered manner. Thank you! If you catch any bug or broken bit of code, a screencap uploaded to imgur and a comment in this post should catch my attention, and I’ll get it fixed ASAP. Other than that, welcome to M6V3! p.s. Oh, also!, we have a facebook page now. Throw us a like if you also book face. Sorry it’s taken a while to update everyone on this! Yes, development on MLP:Fighting is Magic has stopped for now, per Hasbro’s request. Yes, we have tried contacting people about the possibility of squirming out from under the C&D, or triumphantly throwing it off as it smashes into a thousand pieces, we ARE still waiting on a couple of replies, but we are not getting our hopes up. This post will go over a bunch of questions and opinions we’ve seen floating around since the announcement. Despite the recent events, what an amazing journey it’s been. I wish there was a less cliche way to say that. What a prodigious peregrination it’s been. (source: thesaurus.com). But it’s true. Fueled by nothing but passion, creativity, teamwork, and all sleeping in the same hotel bed at least once, our little game has gone from novelty wouldn’t-that-be-cool idea to novelty it-is-actually-pretty-cool almost (painfully almost) reality. Our site has 7 million+ hits, that’s ~14 million eyes looking at this project. Now, I’m no mathematician but I think that’s over 1.3 billion eyes per second for the last 2 years. We are contractually obliged to acknowledge all of those who supported the game and believed in it as much as we did, if not more than us, which is weird (but still appreciated)! We thank the members of our extended team that don’t get mentioned as often as they should, including Ken our sound guy, our QA team, our secret research & development team (which, if somebody asks you, you know nothing about), all our lovely voice talents (Meredith(Twi), Emily (Pinkie), Kira (Mayor), Kim (Rarity), LilyPichu(Fluttershy), Karen (AJ) and Aeva (RD)), those working on the MTSP client (and still are), and those that worked on the game temporarily: Prominence, Mark, and Elosande. Massively special thanks to the FGB (Fighting Game Bronies) for all their hard work and support especially during our CLG tournament!, the EVO staff especially Mr. Wizard and Tom Cannon, the Shoryuken thread contributors, Equestria Daily, Equestria Gaming, Derpy Hooves News, Derpibooru, The Round Stable and especially ESPECIALLY Fenster, Klisk and Canterlot Gardens and Klisk again, Jaxel from 8wayrun, all the awesome competitors at the CLG tournament for their patience and understanding, all the other conventions that invited us to attend, ponychan’s /collab/ (where it all started), Reddit’s /r/mylittlepony and /r/fightingismagic, 4chan’s /mlp/ and even /v/ for unironically enjoying the game (you can’t fool us), Gamespot (Maxwell McGee), and Our Lord (and yours): Voldemort. Also celebrity guest support: Lauren Faust, Jayson Thiessen, Daniel Ingram, Mike Z, UltraDavid, James Chen, @DoomAssistMe, Cristina Vee, Cathy Weseluck for her demo fight, and the cast and crew of the show. But it’s not fair and Hasbro can’t do this and you should fight it! Well it legally is fair, and Hasbro can do this, and we have come to the conclusion (with as much advice as we can afford) that it most likely is not going to be contestable in any sort of realistic way. We are doing what we can and still waiting on replies from a few places, but we don’t want to provide premature hope just yet. Many of you saw the Ultrachen episode (LINKU) where they talked about our situation, and Ultradavid (probably his real name) who is a real-life lawyer – and also plays one on fighting game streams – covers most of the reasons why it is not viable or advisable for us to pursue aggressively. Our efforts to appeal have been met with either stock standard technically and legally correct responses (that don’t differ from the responses that others have received when asking about the game), or silence. Yes, it’s kinda unceremonious that the game can be stopped with the tapping of a lawyer’s keyboard, but that is what has happened as of the moment. It might be a fake C&D!! We wish it was! Hmm.. Or maybe.. this is all a dream! Although in my dreams I can usually jump really far and float off the ground for a while if I bend my legs really low. All signs point to it being real, unfortunately. We don’t think this would help any, it’s really not very interesting, and we don’t want to antagonize the situation any more than we have to. Did you just make up the C&D so you could stop working on it? And yes, this has actually been asked of us. I know questions can’t really be insulting, but this is about as insulting as they can get. I really don’t know how to answer this in any more detail without bringing down the tone of this post and increasing it’s ESRB rating. I can’t even really make fun of it. Why is this a surprise, you must have known!? It isn’t a surprise! We knew what we were getting into, but we had two choices: continue as if we were going to get squished (ie don’t make anything), or continue as if we weren’t (ie make the game). There was never going to be a GOOD time for the C&D, but from the complete silence on Hasbro’s part up until recently, we were hopeful they would benevolently turn a blind eye for a leeeedle bit longer. Or preferably forever. That wasn’t the case. So move to Antarctica or Sealand or China! As a method of dodging the C&D we would file this under ‘prohibitively unrealistic’. Should have been more open/closed! OK. So we’ll address both of those (be more secret, be open source). Since we get both criticisms. Well as they say, “It takes a village to raise a child”, but they also say “A camel is a pony designed by committee.” We were making a pony game, not a camel game! So that idiom has solved the problem for us neatly. Good night. There was no grand plan for any amount of opennessness or closededaciousness. We started making stuff, we put a vid on youtube, then it blew up (popularity-wise, not Michael Bay-wise) (PS. I wanted to put in a Mission Impossible reference but I was told that not many people would get it), (pps. My bad – Anu). I reckon if we hadn’t put that vid on youtube, we would not have gotten as far through the project as we did, at least not to the level of quality it was at. You guys (the fans) actually DRIVE us to do better. To deliver more. It’s not just a coincidence that there are so many personal bests and world records set at the Olympic games. I mean, sure we wanted to make a good game, but once we saw how many people were interested we wanted to make a great one for you. And I think we were succeeding in doing that. I mean if it was totally secret, Hasbro probably wouldn’t have seen us until we released a playable version, sure, that’s true. I don’t think it would have been the game we wanted it to be, or even if we’d bother getting to that stage. I don’t know if that fully addresses the “why not secret?” question. But I think it addresses it enough to move on to “why not open?”. So why not open? Why not make it a community project? Open-source is the best! Hasbro can’t take down all of us! We didn’t want it open. We had no code base. None. There was no code. We still would have not accepted edits into the fightermaker files since they are completely locked and unworkable by two people at once. You cannot merge changes etc. People have mentioned finding programmers to make a new engine from scratch. We really did not see the point considering we were handed an already proven engine from day one. I mean, it was a pretty rough engine, but we knew it could create a game to a quality we were happy with because we had seen full games created on it. In terms of modding, the game would have been just as moddable on actual first release as it was during the development process. Fightermaker is out there for anyone to learn about and play with so that when our game did release people would have some idea how to tinker with it. Given those two facts, the sole reason for having open development would have been to give the public a constant build of the game. We expected people to trust us to deliver a final finished product. We tried to earn that trust by doing livestreams and site updates. That wasn’t enough for some people I guess. A fighting game that is half done, or 80% done, or 90% done, is not a game we’d be proud of. As I’ve said before, it’s a game of direct competition and balance. Once you’ve got your setting and your fun factor, the only gameplay is balance. It’d be like releasing a chess game with a new rule and a new piece every month. The leak is out there, people have fun playing it (to a degree, until the infinites and touch of deaths and inconsistent hitboxes and stuff start to become too frustrating). Sure it might have garnered some interest in our game that otherwise wasn’t there, but we believe that would have happened on release anyway if people were willing to wait. If it makes people feel any better, and they didn’t mind playing a non-finished version of the game, they can just pretend we got C&D’d last july, and the leak was our last public release. If there was any chance that this project was going to make it to the end, we were not going to release a half-finished fighting game. We wanted to be proud of what we produced, and what was out there. We do not feel this makes us selfish or egotistical, but everyone is entitled to their opinion. Why didn’t you just polish up and release a four character beta after the leak? Why not more Betas in general? Somewhat related to the closed/openicity discussion is the criticism about not doing massive alpha and/or beta releases. I think I’ve addressed most of our reasons for it in Point A (see above). Also I addressed a lot of that stuff in the post I made after the leak last year. Unfinished fighting games are not fun. Well, at least, they aren’t the correct sort of fun. We did need alpha and beta testing, but we needed it tight and controlled. So that’s what we did. The calls for releasing a more stable and balanced and complete four character build after the leak don’t really make any sense to us. All we have been doing since the leak is making it more balanced and complete. In fact, making the game more balanced and complete is the definition of the entire development process from start to finish! The leak itself was about as useful as the build a week later, or the week after that, or the week after that. Every iteration was an improvement to balance and gameplay, even to the four characters that were already in there. It was an analog progression. There wasn’t any good milestones (except the first release with vs mode and six playable characters that we were working towards, we would count that as a beta) in which a beta would have been useful to us. You might notice that I said useful to “us”. “What about US?” you might be saying. Referring to yourselves (the community) as “us” not to us (Mane6) as “us”. Of course we know you desperately want to play it, we desperately want you to play it too! Like I’ve been repeating in different ways, playing it for the sake of playing it is not the same as playing the actual game that was intended. We wanted to make the best first impression we could. Yeah it sounds kinda selfish, but remember we’ve been working on this thing in our free time for almost two years.Is it any less selfish to demand to play it before it’s done? We had to make the decision on your behalf. Was that a bad decision? I dunno, but at least you’ve heard our reasons for making it, and I hope you can understand where we were coming from. Why’d you go for the 8th slot at evo with an unfinished game? We didn’t go for EVO! The game was in the running for the 8th slot without our knowledge. It was pushed there by fans! It was your fault!! Nah, it was extremely flattering, and pretty exciting. When we found out that the 8th game was going to be decided by charity drive and realised that the game had already raised some money for breast cancer research, we decided that it was best to go with the flow and see what happened. After they found out that we had not actually put our game in the running ourselves, the EVO team was incredibly supportive and communicative with us during the process, and came up with a pretty neat solution. Of course then Smash bros and Skullgirls kicked our butts! The truth is we didn’t know 100% if we would be ready by then. We were 90% sure we would be. We had planned for a late March release of the six main characters in versus mode only (Wow. I think that’s the first time we’ve written a date down in regards to releasing anything. Kinda exhilarating). There would have been a bit of juicyness and polish missing here and there, and surely a few balance issues, but a solid six player fighter would have been out there playing in the long grass. I guess now we’ll never know for sure.. aww, I made myself sad. People ask this question like we spent our advertising budget to get ourselves known. Our advertising budget is about the same as our animator’s salary. Which is zero. Before tax. All of the attention we have gotten outside the pony fandom has been completely passive. We put videos on youtube and update our site with little fanfare except in our own twitter, sometimes send a warning to EQD. Nothing outside of the pony fandom has been planned or actively pursued by us. We simply opened our door when people knocked. We never left the house. Some of us maybe even literally. Gamespot was another of those opportunities. They seemed genuinely interested and Maxwell was awesome to talk to. Also it was worth it for the comments section alone. What’s all this I hear about the 2013 leak? Easy, there isn’t one. The supposed new leaked build is just the old leak with some parts bolted on by someone or someones. Nothing to do with us in the slightest. It is a ‘new’ build in the same way that I would be wearing ‘new’ underwear if i stole some from the neighbours dirty laundry pile and wore them. Are you going to make the game assets publicly available now? Good question. Very good question. The music is available on RC’s youtube and Whitetail’s youtube. We are confident that the music is well within the remix and such-and-such guidelines, since they are completely original compositions. The art and animation and other such game assets are a bit trickier, legally, as well as emotionally. As of right now, since you’re forcing me to answer in this post that I’m voluntarily writing, I’d have to say “No, not right now”. Why did your staff members leave if everything’s “fine”? One of the announcements was from Prominence leaving over a year ago, we were just clarifying it in writing in public for the sake of possible legal reasons. We didn’t want the possibility of anyone getting in trouble that didn’t need to be. Elosande left for similar reasons – of his own accord – more recently, like after we got the C&D. Rest assured that everyone else working on the game are sticking together. Ifwe are certain our project can’t continue as originally intended, we’re pleased to say we do have a couple of options for where we can go next. Whichever option materialises, it will mean a lot more hard work on our end, and hopefully continued support on your end. It may also mean that our work on Fighting is Magic was not for nothing. Well.. we already know it wasn’t for nothing, we’ve forged some awesome friendships and accomplished a lot, but you know what I mean. To answer the question that’s probably on a lot of your minds: Yes, it will have to be a new, original setting. One obvious major benefit to that is that there will be no more fears of C&D’s and such. Of course, a lot of you are here for the pony aspect. We totally understand that. We do hope that whatever happens that you will check in on us from time to time since we’re confident we can still give you guys something fun and exciting. While we are still working out the details, we promise we will keep you posted as things progress and we have more concrete information for you all.